Mark Cavendish proved to be on song once again on Thursday prior to his early season goal, Milan-San Remo. Not only has he taken win number four so far this year, but an important psychological boost for the race next Saturday. The 26-year-old won the world championships last autumn in Copenhagen, joined Sky and appears to be a new man. He no longer races in team HTC-Highroad and, in three weeks, is expecting his first child with fiancée Peta Todd. With wins in Qatar and in Belgium, the stage race in central Italy is the icing on the cake. Another compliment or “Hey kid, you’re looking good!” prior to Milan-San Remo. Cavendish survived the small climbs in the final two circuits near Arezzo, home of rival Daniele Bennati. He survived a crash that took out young Australian Mike Matthews. And a one-two punch from team Garmin with Robbie Hunter and Tyler Farrar. Sky team-mate Ian Stannard placed Cavendish for the first rise at 10 kilometres out and Edvald Boasson Hagen took him to the line. When Cavendish won San Remo in 2009, George Hincapie helped him in the final kilometres. Norwegian Boasson Hagen was also there that day racing for Highroad, but worked earlier on. He left the team and joined Sky in 2010, and now could fulfil Hincapie’s role. “I missed him. We always worked really well together. 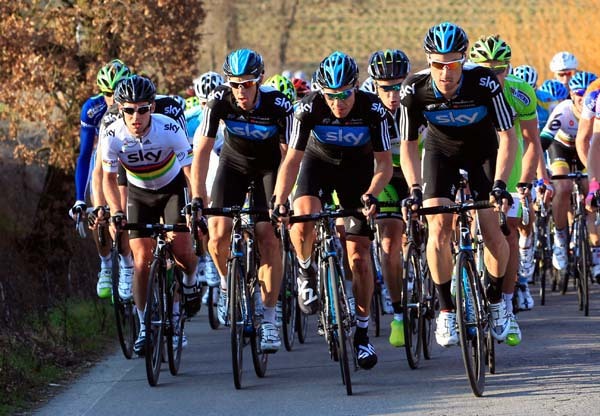 This was the first time we’ve worked together in Team Sky. He didn’t disappoint me. I’m incredibly lucky that he’s as committed and loyal as he is,” Cavendish continued. Cavendish, coach Rod Ellingworth and the rest of Sky received a psychological boost today, but are still concentrating on the winning combination for San Remo. If they get it right, Cavendish will become the first rider to win it in the rainbow jersey since Giuseppe Saronni in 1983.